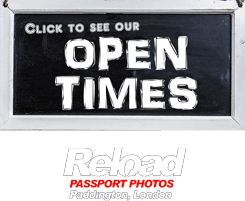 Welcome to Reload Internet, a passport photo studio in Paddington, London, that can capture, print and prepare your Chilean passport photo or visa photo. We are experts in all manner of passport and visa photos, and will ensure that your pictures meet the strict specifications, background, and lighting requirements set by the Embassy of Chile. We will print off your photos instantly, as we aim to have all of our customers photographs ready within 5 minutes of their arrival at our store. We are open every day of the week here at Reload, from early morning until late evening, even on a Sunday we close late at 8pm! When you have your Chilean passport photo or visa photo captured here, we will provide you with a set of 4 photographs at an affordable price – and the even come with a guarantee to be accepted at the Embassy of Chile first time round. The Chilean Embassy is strict with their requirements for passport and visa photographs, and ones you take in a photo booth or with your own camera are likely to be rejected for not meeting all of the specifications. We work with plenty of clients who have previously had their photos rejected, and we make sure that we follow all necessary guidelines to give you photos which are high quality and meet all of the specifications stated by the Embassy of Chile. 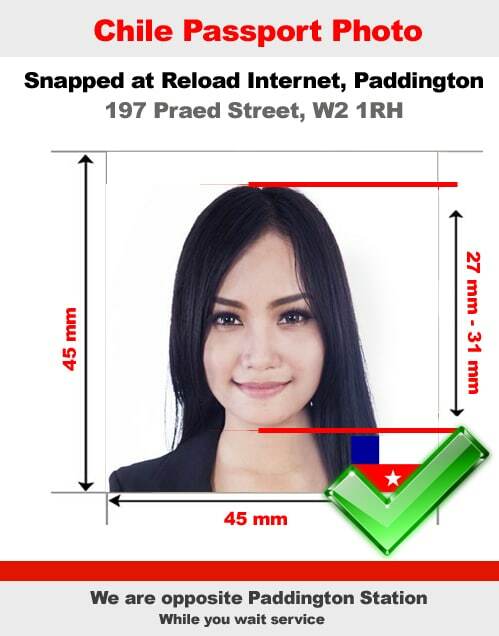 Thanks to our expertly trained staff here at Reload Internet in Paddington, you can be assured that your application will go smoothly, and you won’t face any delays from having to resubmit your photos to the Chilean Embassy. We provide clear photos that are accepted every time! The photo itself needs to be printed on high-grade white paper, which we are able to do for you here at Reload Internet in Paddington, London. Should your Chilean passport photo or visa photo fail to meet these requirements, then it will be instantly rejected by the Embassy of Chile. When you come to us, we guarantee that this will not happen to you and that the photos you submit with your application will be accepted. We receive our specifications directly from the Embassy of Chile’s guidelines on passport and visa photographs, which can be found here.